← Crocheted Lace Collars – These Are Lovely! 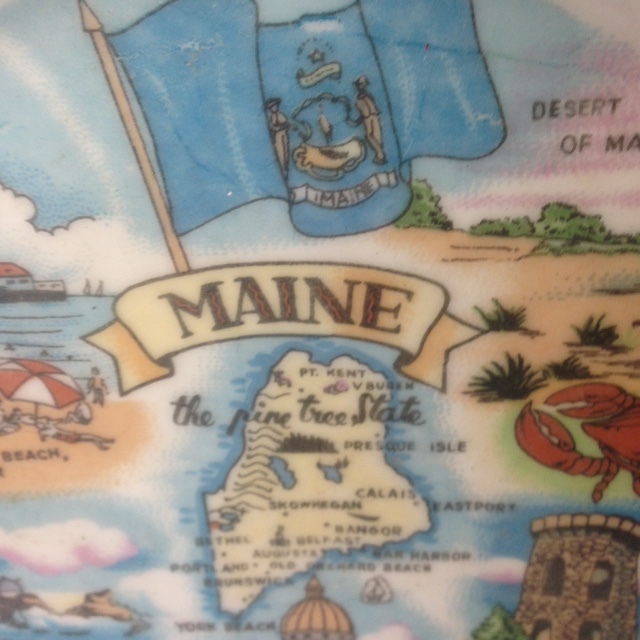 State of Maine Souvenir Ribbon Plate – And a Great History Lesson! This lovely little souvenir map of Maine (8″ in diameter, excluding the points of the reticulation) is what was once called a ribbon plate, as one could thread ribbon in and out among the openings. Ribbon plates were most popular from the late 1800s through early 1900s, and according to one source (http://www.lockside-antiques.co.uk/Ribbon_plates.html): “Many of the plates from the turn of the 20th century had the inscription ‘A Present from’ followed by the place name. This plate is labeled “Made in Japan” on the reverse. Because of a variety of laws passed by customs (with WWII having an impact on those laws), the plate is likely to have been made during 1921-1939, or after 1952. For example, the town of Skowhegan is highlighted, but the much larger towns of Lewiston-Auburn aren’t on the map at all! 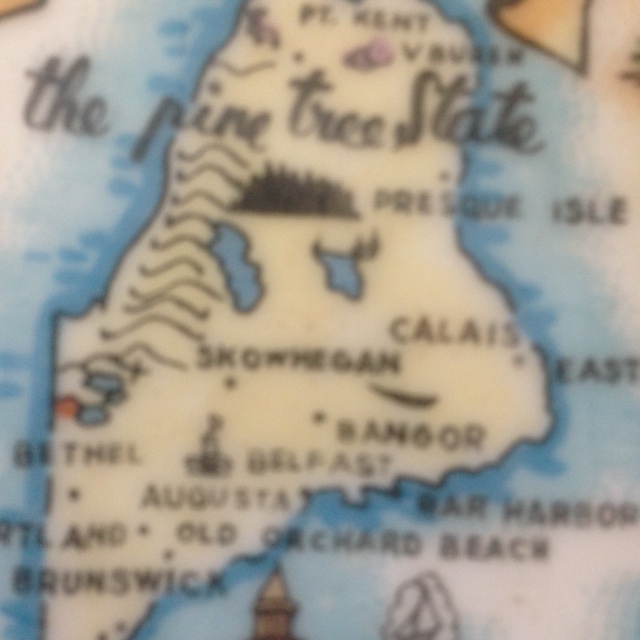 Old Orchard Beach and its pier are pinpointed (the original pier opened in 1898) – although both that town and Portland are misplaced on the map as being north of Brunswick. 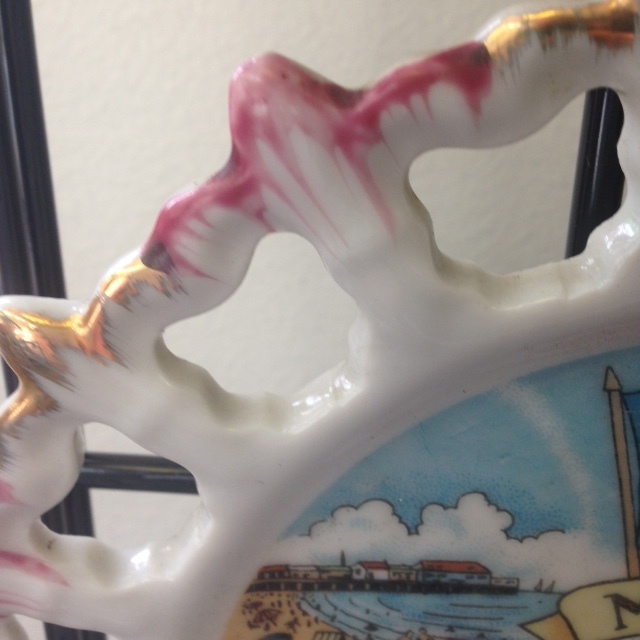 Further, the plate highlights “Casco Castle” which was built in South Freeport in 1903. Age & Condition: So… it seems we have a 90+ year old plate – and it’s in pristine condition… no chips, cracks or other blemishes. Price: $28.00. Plus 5.5% Maine State sales tax. 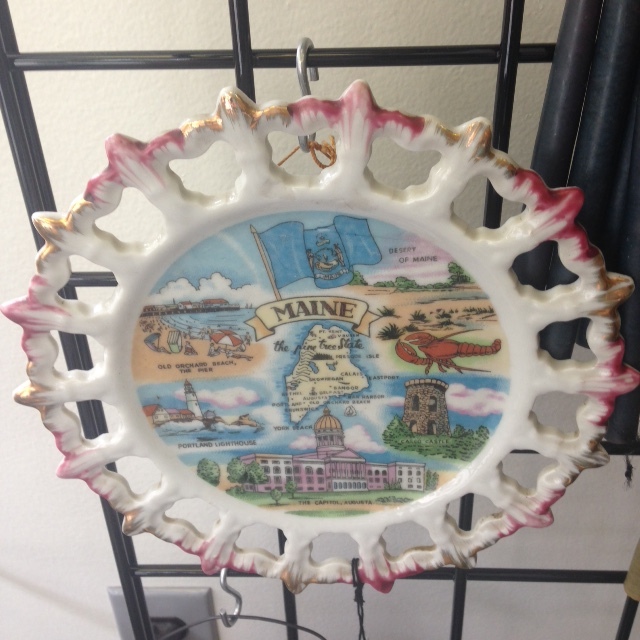 This entry was posted in Maine, Souvenirs & Tourist Items and tagged collectible, Heritage Collectibles, lattice plate, Made in Japan, Maine, plate, reticulated, ribbon plate, souvenir, souvenir plate, tourist. Bookmark the permalink.